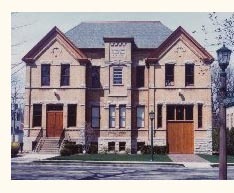 Because we are the Wilmette Historical Museum, we collect items with a local connection, things that can help us tell the story of this community. We get offered a lot of very interesting and beautiful old heirlooms that we wish we could accept but can’t, because they don’t have any real connection to Wilmette. Almost every single photo, document, or object in our collections came to us because somebody decided to offer it to us as a donation. If something has a story that connects it to Wilmette, chances are we’d like to see it. It might be that pair of embroidered bell-bottoms you wore to a party when you were at New Trier. Or the home movie your dad made of your sister’s birthday party. Or the letters your grandfather wrote home to Wilmette during World War II. Or the old floor plans that the previous owners of your Wilmette house passed along to you. If you’re not sure, please ask us. Some little thing that might seem trivial or disposable to you might be very interesting to us. If it duplicates something already in the Museum’s collection, we’ll tell you. But we’re always glad to be asked. Donating is simple. Phone or email us or stop by, and we can talk about whether those items might fit our collection program. I If we decide to put your item in the collection, we’ll give you a “Deed of Gift” to sign, and will make a copy for you to keep. All donations to the Historical Museum are permanent, and all are tax-deductible. 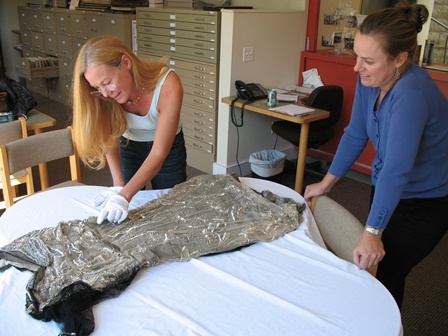 All donations that we do accept are displayed, stored and preserved according to the highest standards of professional museum care, in archival enclosures and locked, climate-controlled storage. If you have any easily lost or damaged items of Wilmette interest and want to make sure that they are permanently kept safe so that future generations (including your own descendants) will be able to enjoy them, please consider making a donation.